The New York Times headline on April 4 was simple enough, “After 37-Year Search, Israel Recovers Body of a Fallen Soldier,” but the memories it dredged up were both painful and complicated. Here’s the simple news story that appeared this past Thursday: Four days before Israelis will go the polls to vote, the remains of Sergeant Zachary Baumel, who had gone missing in 1982 during Israel’s invasion of Lebanon, were returned to his family for burial. The remains reportedly were found by Russian and Syrian troops and then sent by Russia to Israel. The entire event is being celebrated in Israel and being seen as a pre-election gift for Prime Minister Benjamin Netanyahu, who is currently being hounded by pending criminal charges ranging from corruption to bribery. The Israelis with their superior air power and artillery ran roughshod over the south of Lebanon and after bombarding and destroying the magnificent western side of Beirut — devastating its infrastructure and even destroying its hospitals. 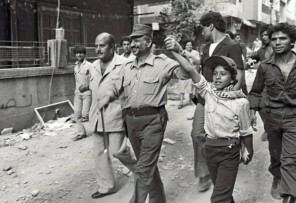 Israeli troops then entered and occupied the city, plundering, looting, and terrorising the trapped civilian population as they moved through Beirut’s ruins. While some Americans recall the massacres in the Palestinian refugee camps of Sabra and Shatilla (committed by Israeli-allied Lebanese militia as Israelis stood guard at the camps’ perimeters), in fact the entire war was a massacre. In just three months, over 18,000 were killed (mostly Lebanese and Palestinian civilians) and over 30,000 were wounded. I remember this period all too well because I helped start and then ran ‘Save Lebanon’, a project to bring severely wounded Lebanese and Palestinian children to the US for medical treatment that was unavailable to them in bombed-out West Beirut. In all 65 maimed children came to us. One little girl, Fayzeh Amin, lived with my family for six months while doctors worked to save her cluster-bomb-shattered leg. I have a picture of Fayzeh and two other girls, Fatmeh and Amal, on the wall of my office. It is a constant reminder of the pain of that war. I also have a few hollowed-out Israeli cluster bomb casings I found near a Palestinian camp in the south of Lebanon. They too serve as reminders of the inhumanity of that period. Less than a decade and a half later, I joined then US Vice-President Al Gore at a dinner at the Israeli Knesset. I was one of the co-leaders of a project Gore had launched in the post-Oslo period to help grow the Palestinian economy. I admit to being more than a little uncomfortable at that dinner since I was the only Arab American in a room filled with the members of the Knesset, Gore, and the rest of his team. As the evening went on, Gore, maybe sensing that I was uneasy, came over to rescue me and brought me to sit next to Leah Rabin, the wife of the late, assassinated prime minister. He told her that I had just visited my family in Lebanon and encouraged me to share my story with her. I also recall from that night that it was the lead-up to the 1996 Israeli elections and the Clinton administration wanted nothing to do with Netanyahu, who was challenging then Prime Minister Shimon Peres (who had succeeded Rabin following the assassination); Gore appeared to make a determined effort not speak to or even acknowledge Netanyahu. Mrs Rabin noted this, at one point, and told me, her voice filled with bitterness and sadness, that she held Netanyahu responsible for the incitement that led to her husband’s murder. Enough said. These were some of the memories that came rushing to the fore as I read The New York Times article. The problem is that these memories can’t just be buried and laid to rest. The maimed of Lebanon’s war will be crippled for life. The families of the those who were massacred from the air or by militia at point blank range will continue to mourn their incalculable losses. Meanwhile, there are Israelis who will still gloat over having “visited” Lebanon. And Netanyahu, who was elected in 1996 on a platform promising to end the peace process, not only met his goal during his first term, but came back for three more terms. He now stands poised to win a fifth term and, as perverse as it may be, is being helped by the return of the remains of a soldier who died in the horrible invasion of the summer of 1982. There are those who may say that I should just forget this hurt-filled past and move on. Forgetting, however, isn’t an option. Justice is the only cure that will close those old wounds. And given what is unfolding in today’s Israel, justice seems further away than ever. Dr James J. Zogby is the president of the Arab American Institute, a non-profit, non-partisan national leadership organisation.